With over 30 years in business, South Coast Glass has the expert advice and vast experience in designing and installing beautiful custom shower enclosures and other quality commercial or residential glass and mirror products for any customer need! South Coast Glass has been family owned and operated since 1983 and is your premier source for custom shower doors as well as professional glass and mirror fabrication, repairs, and installation throughout all of Orange County and San Diego County. Here at South Coast Glass, we deeply believe in and specialize in quick and quality service for our customers. In order to ensure the quality of our work we have built an extensive in-house fabrication facility which includes our own beveller, edge polisher, as well as many other machines for custom glass fabrication, which many other businesses do not have in-house. 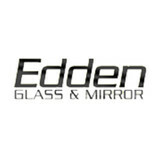 Our facility allows us to offer our customers high quality products such as custom beveled mirrors, shower doors, glass tabletops, window glass, mirrored wardrobe doors, and many other glass products with a very quick turnaround time and high quality workmanship as we are also able to directly oversee all the steps of production and fabrication of their order. Stock many different types of glass such as rain glass, bamboo glass, and also the low iron starphire glass (also known as ultra clear glass) and offer excellent pricing on them as well. Please visit our San Juan Capistrano location showroom, which features full sized displays of most shower enclosures and other products we offer! Give us a call or email us today for any of your project needs! Serving all of Orange County & San Diego County! The Design In Elegance philosophy on designing, fabricating and installing all of our products is simple. Do it right the first time, use only the best materials and hardware available, and instill a sense of pride in our Family of Employees. Design In Elegance Inc. supplies and installs a large array of Shower and Tub Enclosures, ranging from your Standard Framed Doors to custom 1/2" Frameless Doors; we also supply and install Wardrobe doors and Mirrors. 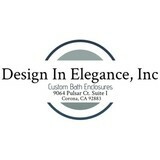 Our Installers are all Design In Elegance Inc. Employees; we never contract out our installations to other contractors. This ensures you the most qualified person for your project. Design In Elegance Inc. offers FREE ESTIMATES by its Highly Qualified Sales Staff who are Extremely Knowledgeable about all of Design In Elegance Inc. Products. John and Nancy Ferguson are the owners of Stained Glass Overlay of North Orange County and Hacienda Heights / Whittier. They started their art glass business in 1981. There, they serviced Whittier and the surrounding areas for 9 long years; now located in their current studio in Anaheim Hills, CA. The Ferguson’s began their business as a Stained Glass Overlay franchise. As time went on their love of all types of decorative glass increased and they began offering Stained and Beveled glass, Etched and Carved Glass, as well as many products that go along with decorative glass. They are a highly award- winning studio for both design and sales. The art glass and flat glass industry is an ever changing field. The Ferguson’s continue to take advanced training to keep up with the new trends; they are considered experts in their field. The goal for their studio is to provide their clients with the most beautiful art glass available and provide excellent customer service. When this is accomplished your past clients become your repeat clients and your referring clients. For the past 10 years, Quality Performance has been providing a wide range of services in Southern California. We are a family-owned and -operated business that caters to the needs of homeowners and business owners. Glass and mirror add aesthetic as well as functional value to your property. We make sure that you get the exact design and type of glass that you have in mind for your windows and doors. Our areas of specialization include patio doors, tabletop glass, to name a few. Please go through our services page for more information. Our custom-made glass and mirrors are reputed for exemplary craftsmanship. We understand your requirements as well as specifications and endeavor to deliver eye-catching products that create the perfect ambiance at your place. Our goal is to offer innovative glass solutions for varied purposes that enhance the utility of your doors, windows, patio, table, etc. Utilizing cutting-edge technology, we ensure that you get only flawless products. Moreover, we strive to provide impeccable service within the stipulated time to our residential, commercial as well as industrial customers. Contact us today and find out how we can serve you better. College Glass & Mirror Inc.
Eco glass systems inc. is a family company. We supply, service, distribute, and install glass and glazing products. We specialize in commercial and residential applications. From shower doors to retail storefronts, we strive to lead the forefront of technology, design, and engineering in the ever changing glass industry. We also look to the future with new products that will change our lives for the better. Safety, convenience, simplicity, and security are some of the many things glass can provide. We want to impliment glass and its amazing properties into all faucets of life. This will not only make things easier, but also better for the environment. With our Ecosystem a main focus Eco Glass pushes the boundries of energy conservation, recycling, self sustainability. We want to also provide beauty in your home and office, with colored, and textured glass. Eco Glass is excited about the many problems that glass can solve and what the future holds for the glass industry. Glass roads, smart glass walls, solar glass, these amazing technologies are here. Eco glass is the company that can do it. Call us with your glass problem and we will solve it. If we cant we’ll help find someone who can. We provide residential and commercial contemporary glass railing fabrication and installation.glass gates, glass fence, glass door and glass balcony railings. What can a local Costa Mesa glass company help me with? If it’s a major home glass repair or replacement, the Costa Mesa glass company should work directly with your insurance company to help bring down costs for you, if applicable. Find Costa Mesa glass companies on Houzz. Narrow your search in the Professionals section of the website to local glass, mirror and shower door services in Costa Mesa, CA and read reviews and ratings to find one that fits your needs.